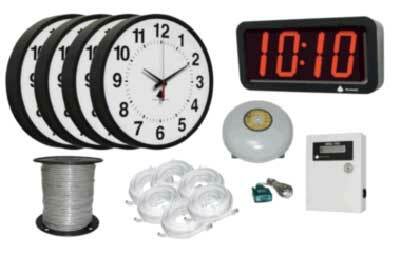 Clocks in a Box" is a turnkey Synchronous Time Solution that is pre-engineered to offer a complete, programmable bell system for small businesses. The system offers quick and easy setup using plug-and-play connections. Absolutely everything that is needed is included in the box, so there’s no time wasted on trying to figure out which accessories and parts to order. 41357B Same as you'd get from Grainger Supply, but for far less. This Package Includes everything you need, including the cables! You can run up to 8 bells total, more with the Pyramid power booster. the industry’s first 3-year limited warranty on Master Clocks. Note: The maximum distance for clocks and bells is 300 feet. Power boosters would be needed to go beyond that.